Janet Yellen breezed through questions about the financial crisis, the Fed's stimulus efforts and banking regulation, as the Senate Banking Committee weighed her nomination to serve as future head of the Federal Reserve on Thursday. While a few senators raised concerns about the more than $3 trillion in stimulus the Fed has been injecting into the U.S. economy, Yellen defended the central bank with ease, often pointing to high unemployment as her top concern above all else. "This is a virtually unprecedented situation," she said, referring to the 4 million Americans who have remained unemployed for more than six months. "We know that those long spells of unemployment are particularly painful for households, impose great hardship and costs on those without work, on the marriages of those who suffer these long unemployment spells," she added. "So I consider it imperative that we do what we can to promote a very strong recovery." Asked about the risks of more stimulus, Yellen repeatedly told the senators she currently sees no major bubbles forming, including in the stock market and housing market. Stocks have been routinely hitting new highs and housing prices have been rising this year, driven largely by the Fed's policies. "Stock prices have risen pretty robustly, but I think that if you look at traditional valuation measures ... you would not see stock prices in territory that suggests bubble-like conditions," Yellen said. Asked by Republican Senator Bob Corker if she would have the courage to "prick" bubbles, Yellen responded: "I believe that I would." The Federal Reserve has been trying to stimulate the economy since December 2008, first by slashing short-term interest rates to near zero, and next by launching three bond-buying programs in an attempt to lower long-term rates as well. The bond-buying program, known as quantitative easing, remains controversial but is still ongoing. The Fed currently buys $85 billion each month in Treasuries and mortgage-backed securities. If confirmed, Yellen faces a daunting task: How to wean the economy off Fed stimulus at the right time. Leading up to the hearing, some Fed watchers thought the central bank may begin to slow its bond-buying program at its next meeting in December. Yellen, however, seems convinced that the bond-buying program could still help the economy. The benefits continue to outweigh the costs, she said. "It's important not to remove support, especially when the recovery is fragile," she said. "I believe it could be costly to withdraw accommodation or to fail to provide adequate accommodation." Much of the hearing focused on the Fed's role as a banking supervisor. Democratic Senator Elizabeth Warren urged Yellen to make banking regulation just as a high of a priority as monetary policy. "The truth is, if the regulators had done their jobs and reined in the banks, we wouldn't need to be talking about quantitative easing because we could have avoided the 2008 crisis," Warren said. At one point Warren also suggested the Federal Reserve plan regularly scheduled meetings to discuss regulation -- just like it does to discuss interest rates. 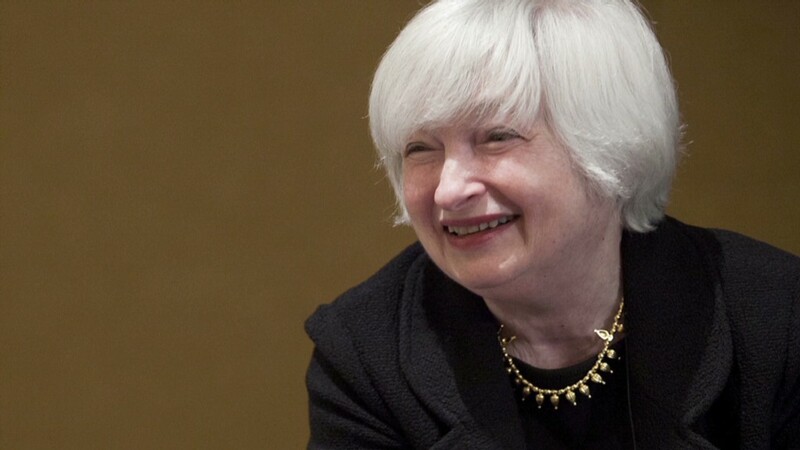 "I think that's a very worthwhile idea," Yellen responded. Bernanke's second term ends January 31. Despite protests from a few Tea Party Republicans, Yellen is widely expected to be confirmed for the position before then, given the Democratic majority in the Senate.